Pure 100% vegetable based soap, palm oil free, with no perfume or fragrance added, no animal ingredients, and not tested on animals. Washing in soap gives you the softest, smoothest, and most comfy feeling bluejeans, shirts, and under garments. Bed sheets and towels washed in soap feel amazing. The soap lubricates fabric fibers making fabric move and flow smoothly and easily, offering a feeling of softness and comfort like a familiar hug, which is especially nice for those with sensitive skin. The manufacturer, Dri-Pak Ltd. in England, is a family owned company with over 100 employees. Their history is filled with useful and time-honored products, some of which have been selling for over 200 years. Their products are purchased by new customers and by customers who have purchased Dri-Pak products for decades, even generations, because in addition to being simple and safe, Dri-Pak products work well and have so many uses. 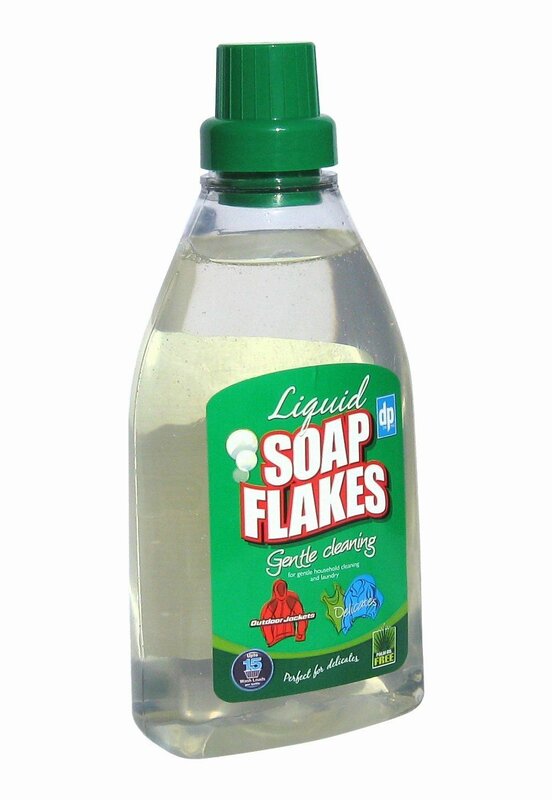 Liquid Soap Flakes are very easy to use. No need to grate soap bars, or to dissolve flakes in order to use pure soap. Use Liquid Soap Flakes in your washing machine like any other modern laundry liquid, or use in a bucket or sink with water to do handwashing of delicate fabrics. 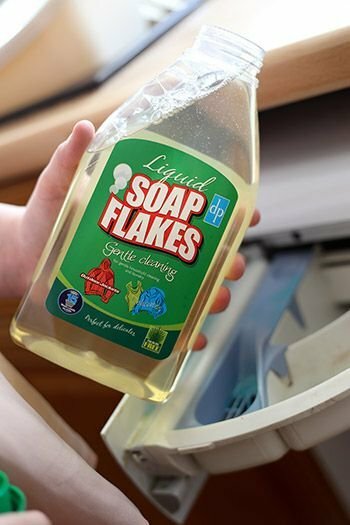 To use Liquid Soap Flakes in an automatic washing machine, add one to two capfuls (depending on the hardness of your water), to your machine's detergent drawer and choose the appropriate wash cycle according to your garments' washing instructions. Ensure that the drum is at least half full to prevent build up of excess foam. If you are hand washing items, then add Liquid Soap Flakes to warm water and wash according to the garments' instructions and then rinse thoroughly. Liquid Soap Flakes are suitable for washing breathable waterproof clothing and can be used to clean real wood and laminate floors, terra cotta tiles, and other surfaces. No synthetic detergents. No SLS. No enzymes. No phosphates. No perfume. No optical whiteners or brighteners. Made of pure soap from a 100% vegetable base. Can be mixed with other time honored ingredients such as washing soda, Soda Crystals, borax or baking soda. Kind on skin, fabric, and the environment. Call toll free 1-888-508-3496 now or send us your completed Liquid Soap Flakes Order Form.pdf, or shop online by pressing the button below and start enjoying the simple luxurious effectiveness of pure soap today. At any time for any reason, if you are unhappy with how Liquid Soap Flakes work for you, we will gladly refund your entire purchase cost. Buy three or more 750ml / 25.36 oz bottles and save. Might you be interested in some Soda Crystals too? Or some dry Soap Flakes?